Here's what you need to know as we head into Week 7. 1. Aaron Rodgers is just fine. Rodgers put on a show Sunday with an impressive 338 yard, 6 touchdown performance against the Texans, one of the best defenses in the NFL. 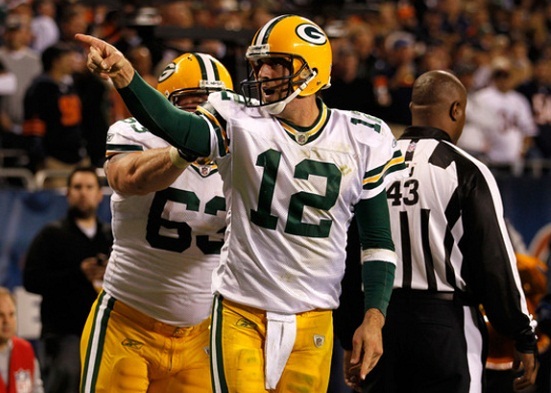 After having only 3 scores in the first 3 weeks, Rodgers has stepped up his game with 13 scores over the last 3 weeks. St. Louis and Jacksonville are coming up on the schedule for the Packers, so expect the great play to continue. Rodgers is currently on pace for over 4,000 yards and 40 TDs, making him well worth the first round pick you spent on him. 2. Don't go crazy over Shonn Greene. Greene ran over, through, and around the Colts D on Sunday -- to the tune of 161 yards and 3 scores. However, Indy's run defense has been suspect all year, and is ranked 26th overall in that department. While Greene looked great on Sunday, his track record should tell you that he doesn't have many games like that left in him for the rest of the year. Prior to Sunday, Greene had just three 100-yard games since the 2010 season. New York's offense is suspect at best, so don't expect him to continue to have big outings. 3. Ahmad Bradshaw is making noise. The oft-injured running back out of Marshall has impressed over the last few weeks, with 316 yards and 2 TDs against Cleveland and San Francisco. Early on in the season, it looked like his job was in jeopardy due to solid performances from Andre Brown. But the last 2 games, Bradshaw has taken his spot back with an aggressive running style and toughness. While Eli Manning, Victor Cruz, and Hakeem Nicks get all the attention, Bradshaw is possibly the heart and soul of the team, as they are 10-0 all-time when he rushes for over 100 yards. Pay close attention to his foot issues moving forward though. It could hinder him throughout the season. 4. I was wrong about Tony Gonzalez. After Week 6, in most formats, the future Hall-of-Famer is the No. 1 tight end in Fantasy Football, and he has done it despite being the third option on most passing plays. Even though he struggled a bit on Sunday with just 4 catches, Gonzalez has 14 more grabs than any other tight end in the league right now. I thought with his advanced age and the continued emergence of Roddy White and Julio Jones, Gonzalez would be all but an after thought in the offense. I was wrong. He has 4 TDs already this year, and should continue to be a major factor -- especially in the red zone. 5. The Ravens D could be in trouble. Through the first 6 weeks, the Ravens D has forced 13 turnovers and scored 3 total touchdowns between the defense and special teams. Those numbers put them in the top 10 in most formats -- but there are signs of trouble in Baltimore. The injuries are starting to pile up, with Ray Lewis and starting corner Lardarius Webb missing the rest of the season. Also, an injury to DT Haloti Ngata will leave this D very thin in the coming weeks. Currently, the Ravens rank 28th in total yardage defense, and they have given up over 200 yards rushing in each of the last 2 games. Not good for one of the first 5 defenses taken in most drafts. Someone on this site is actually admitting they were wrong about something? That's a first. The internet is a big place Adam. Go troll elsewhere. Im one of the lucky ones that drafted Baltimores defense.